Friends and strangers to our industry often ask ‘why don’t I produce more in the UK?’ To illustrate my answer, I usually point to my receding hairline and premature greyness. God knows, I’ve tried. Here’s a cautionary tale to warm your hearts this festive season. 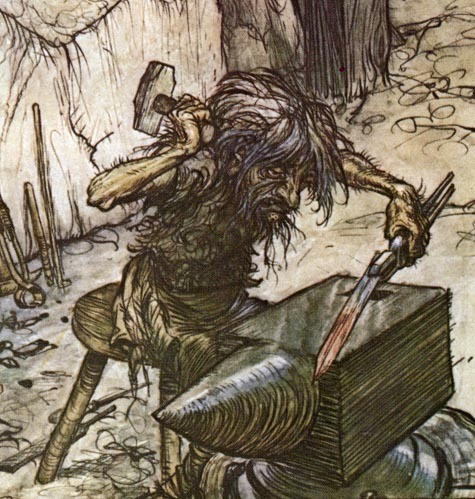 Once upon a time, long ,long ago, there lived a goblin called Metalbasher. He worked in the mediaeval town of Walsall, and made cufflinks for Prince Simon. But as Prince Simon opened more and more of his magical shops, Metalbasher struggled to keep up. ‘Come on Metalbasher,’ the Prince said, impatiently, ‘It’s no good shutting at twelve every Friday when there’s work to be done!’ But Metalbasher didn’t see things like that. This was the way he’d always done it in the cave, as had his fathers before him. ‘Never try anything new, Son’, had been his Father’s last words. So when Prince Simon asked Metalbasher to by a new forge and hammer, and hold bits of iron in stock, he refused! ‘Why would I do that?’ he said, puzzled, as he shut the cave at three thirty sharp as he did every day, so as not be annoyed by customers ringing with their pesky orders in the afternoon. ‘Because you’ll have more orders and take on more goblins!’ shouted Prince Simon, cross because there was no stock in his magical shops. It was no good. Metalbasher hurrumphed and parrumphed and refused to even speak to Prince Simon. More goblins indeed! So Prince Simon set sail across the seas and found the Offshore Kingdom, populated by the mysterious peoples, quick to promise everything. In a flash, they set up their shiny forges in remote rural parts of the country and trained their elves to be as fast as fork of lightning. The Offshore Elves were only too happy to try new experiments as long as Prince Simon paid, up front of course. So how does our cautionary tale end, dear reader? Well Prince Simon set sail with his bounty of Offshore Kingdom cufflinks and filled his magical shops with well made goods delivered on time. But as the years went by, the Offshore Kingdom elves grew plump and greedy. Eventually Prince Simon tired of their ever extravagant price demands. ‘Whatever happened to Metalbasher?’ he wondered wistfully. He sent his faithful carrier pigeon to his cave to find out, careful to allow enough time to reach there before three thirty and midday on a Friday. Alas! The cave was now populated by young bearded and fashionable types, drinking coffee and sat at Metalbasher’s anvil! ‘Hey ho, ‘ said Prince Simon, and he set sail again to the Offshore Kingdom….